The men and women who sign up to serve and protect this country deserve a place they can call home. No military member should return home from service and have to experience homelessness. To help homeless veterans achieve the American Dream of homeownership, Homes for Heroes is proud to support the AREAA Education Foundation and their Welcome Home for Heroes Housing Assistance Program. The U.S. Department of Housing and Urban Development estimated that 39,471 veterans were homeless in 2016. That is equal to 7% of the United States homeless population. Much of this homelessness can be attributed to the post-war wounds these veterans carry with them. Mental illness, trauma and physical injury makes the qualifying process for home loans difficult. VA loans for veterans have simplified this process, however many veterans still pay more than they can afford for housing. The Welcome Home for Heroes Housing Assistance Program was created by the AREAA Education Foundation to address the homeless problem among veterans. Founded in 2015, the Welcome Home for Heroes Housing Assistance Program provides qualified military families with financial assistance and professional counsel for housing. In support of the AREAA Education Foundation’s efforts, The Homes for Heroes Foundation is proud to contribute to the Welcome Home for Heroes Housing Assistance Program’s fund. 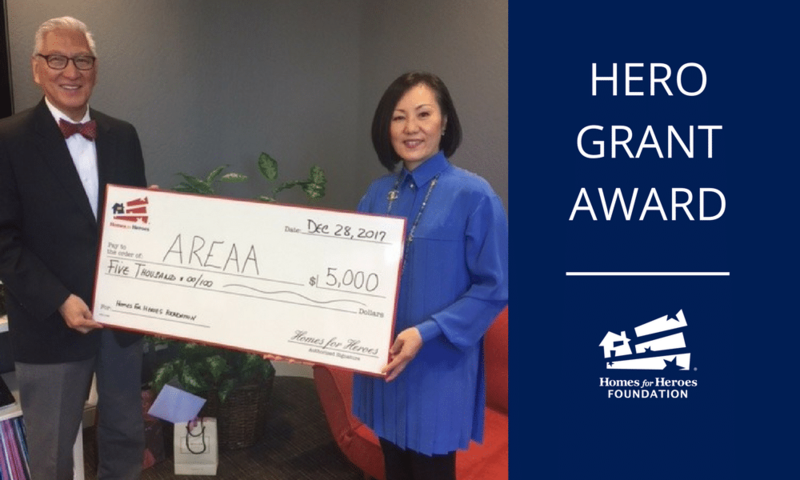 On December 28th, 2017, Homes for Heroes Specialist, Traci Jump, presented the AREAA Education Foundation with a grant of $5,000 on behalf of the Homes for Heroes Foundation. This grant will be used to help veterans cover housing expenses such as major house repairs, remodeling, or down payment assistance.